OUR LORD JESUS CHRIST, the sweetest master and Lord, the creator of angels and of all intelligible and perceptible creation, saw that the human race didn't know him to believe that he is both in heaven and on earth, and lord and governor of all things. Moreover, without the will of our Christ nothing can be established. And [he] saw that people were being deceived by the devil, who hates good, who had them all under his will and made them his own together with their families. So the compassionate God wanted to embarrass the devil and to free man from him, so that man would receive a great gift from his compassion. Consequently, from the great love which he had for our race, among the many and infinite gifts that he gave us, he condescended and became perfect man from the Holy Spirit and the purest blood of our Lady the Theotokos and Ever-Virgin Mary. This is why he became flesh and became perfect man, so that we may see him and learn about him; that there is no one else beside him in whom we can believe, who'll free us from the abominable hands of the devil and make us sons and heirs of his kingdom to be glad and rejoice together forever with the holy angels in paradise, and not to burn in the accursed hell together with the accursed demons. OUR LORD AND GOD JESUS CHRIST, my brethren, our sweetest ruler and master, the creator of angels and of all intelligible and perceptible creation, moved by his compassion, by his great purity, and by the great love which he had for our race, has given us and continues to give to us each day, hour, and minute many and an infinite number of gifts. 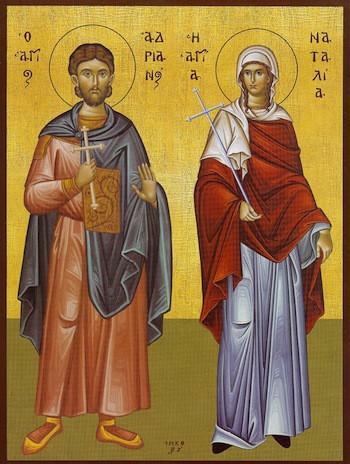 In addition, he has made us worthy this day to glorify and honor him and our Lady the Theotokos. 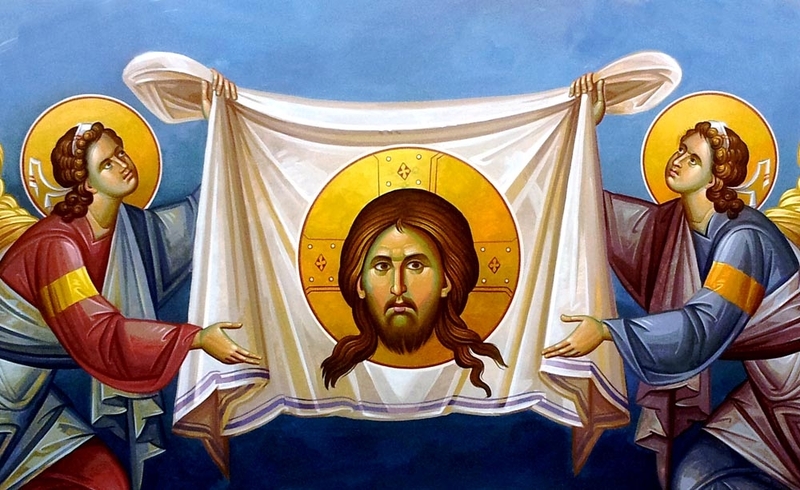 And may it come to pass that the Lord will have compassion on us, forgive us our sins an d make us worthy to spend our time here well, and to go to paradise to glorify the All-Holy Trinity. The Theotokos of Chalkoprateia was one of the most important churches of Constantinople dedicated to the Virgin Mary until the church at Blachernae took its place, though even after it was a close second. 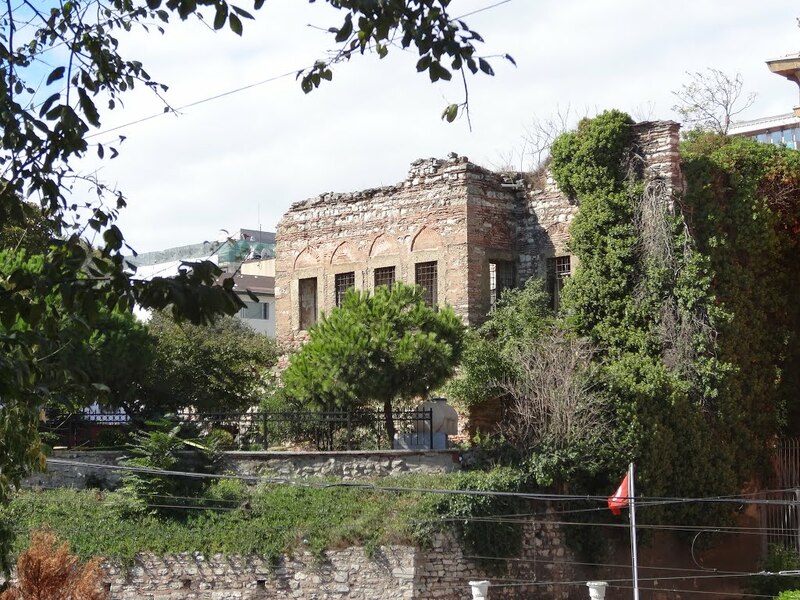 It was located to the north of the Patriarchate and at a small distance from Hagia Sophia. 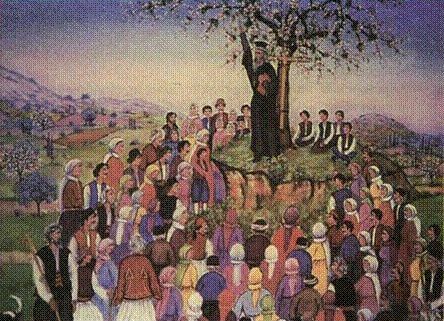 The mid-16th century traveler P. Gilles notes that Chalkoprateia was not far from the Milion. According to a written source the name derives from the installation in the area of Jewish craftsmen who manufactured and traded bronze objects, already by the time of Constantine the Great. The district was also known as the district of Chartoprateia (of the paper trade), because there were workshops of writing material. 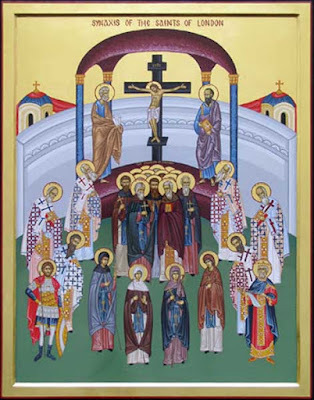 By the late sixth century there was a procession with the garments of the Theotokos every Friday in Constantinople between the churches of Chalkoprateia and Blachernae. May the Holy Trinity have mercy upon us and save us. Amen. 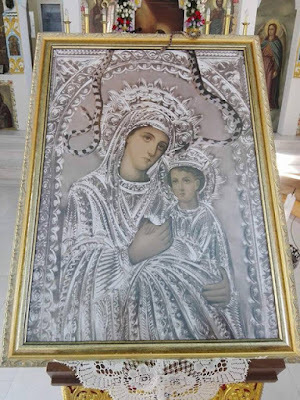 Most holy Theotokos, help us and save us. Amen. OUR LORD AND GOD Jesus Christ, my brethren, our sweetest Lord and Master, the creator of angels and of all intelligible and perceptible creation, moved by his infinite compassion and by the great love he has for our race, condescended, among the infinite and many gifts he has granted us, to become perfect man by the Holy Spirit and the purest blood of our Lady the Theotokos and Ever-Virgin Mary. He became incarnate to free us from the hands of the evil devil and to make us sons and heirs of his kingdom, to rejoice and to be glad with the angels forever, and not to be burned with the wretched demons. Saint Alexander of Svir was born on July 15, 1448, on the feast day of the Prophet Amos, and was named for him in Baptism. 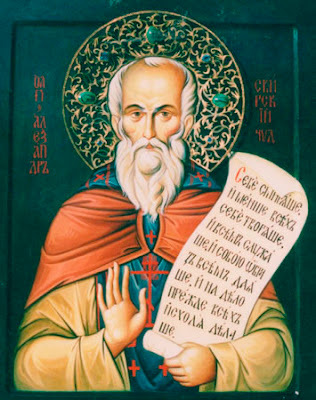 Saint Alexander was a beacon of monasticism in the deep forests of the Russian North, living in asceticism, and he was granted the extraordinary gifts of the Holy Spirit. The blessed monk Lazarus Dionysiatis (+ 1974) is well-known for his book Dionysian Narrations in which he records the valuable memories of those Dionysian Fathers of Dionysiou Monastery at Mount Athos. 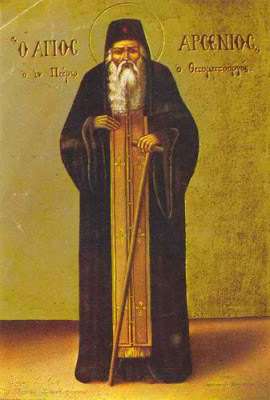 One of these narrations concerns Elder Bessarion, a blessed brother of Dionysiou Monastery. Fr. Bessarion was from Halkida of Evia. He reposed in the Lord in 1952, at the age of 76. Before his repose he was the Oikonomos of the Metochion of Dionysiou Monastery in Sykia of Halkidiki, known as Kalamitsi. When he sensed his death approaching, after bidding farewell to his acquaintances and friends, he told them very simply that he was "going to the Monastery to die"! The Pratsika family was a wealthy family of Patras, members of which were distinguished as merchants, landowners and politicians. The family was of Epirus descent. 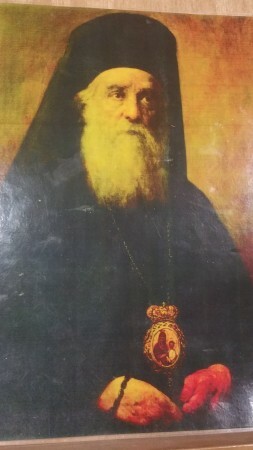 John Pratsika was the leader of the Christian community of Dhrovjan, a community in the Vlore County of southern Albania, when it was under Ottoman rule. He was assassinated by Ali Pasha, with the result that his sons Kotzas and Sideris fled first to Kerkyra and then around 1800 they settled in Patras of the Peloponnese. In Patras the two brothers, especially Sideris, purchased a large estate southwest of the city, and they began to cultivate it. Dear God-fearing Christians, the feast which we have gathered here to celebrate together today is radiant and filled with divine joy. It is rightly called radiant because it shines from the very name of him whom we are honoring today, since he is called the lamp of the light. He is not, of course, a lamp who illumines us with material light, because then his radiance would not be enduring and constant and would be lost every time some obstacle moved in front of it. 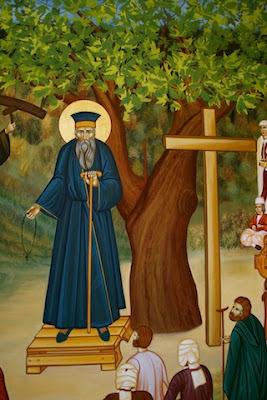 But it is light that shows the brilliant radiance of divine grace in the depths of the hearts of those who have gathered to celebrate his memory and who elevate their minds to think upon the sufferings of the righteous man, so that gazing with the eyes of our souls upon his blessed martyrdom, we shall be filled with spiritual joy. 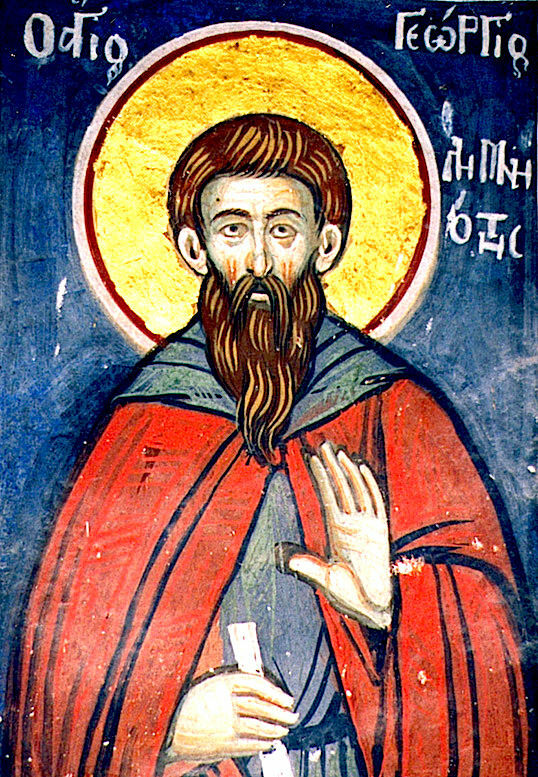 Though Emperor Basil I is not mentioned in the Synaxaria, he is recognized as a Saint of the Church in the Byzantine Calendar of Feasts by Manuel Gedeon. 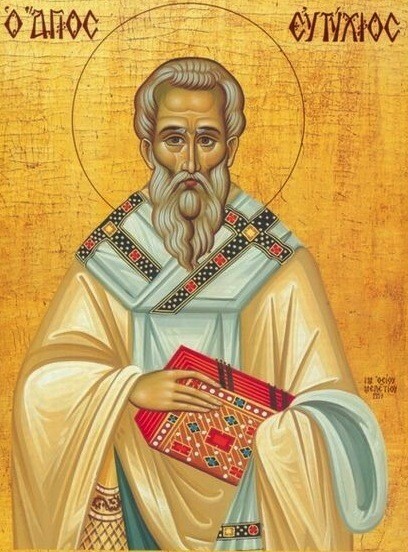 This is primarily due to the fact that he was a builder and restorer of many churches and monasteries, and he was a pious man who sought to glorify God, despite his many faults. Basil I, called the Macedonian, was Roman Emperor who reigned from 867 to 886. Born in 811 at Charioupolis in the Roman theme of Macedonia, he rose in the Imperial court, and usurped the Imperial throne from Emperor Michael III (r. 842–867). Despite his humble origins, he showed great ability in running the affairs of state, leading to a revival of Imperial power and a renaissance of Byzantine art. He was perceived by the Romans as one of their greatest emperors, and the Macedonian dynasty, which he founded, ruled over what is regarded as the most glorious and prosperous era of the later Roman Empire. Saint Sebbi was son of Sexred and was the joint King of Essex from 664 to about 683 along with his cousin, Sighere. 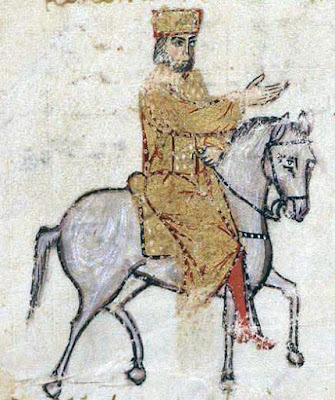 After Sighere died, Sebbi became sole ruler of Essex until 694. Sighere and Sebbi were cousins of their predecessor, Swithelm. In 665 Sighere apostatized and fell back into paganism, while Sebbi remained a faithful Christian. They soon developed a rivalry. Sighere found an ally in Wessex, and Sebbi in Mercia. As a result of their rivalry, King Wulfhere of Mercia established himself as overlord of Essex in 665. 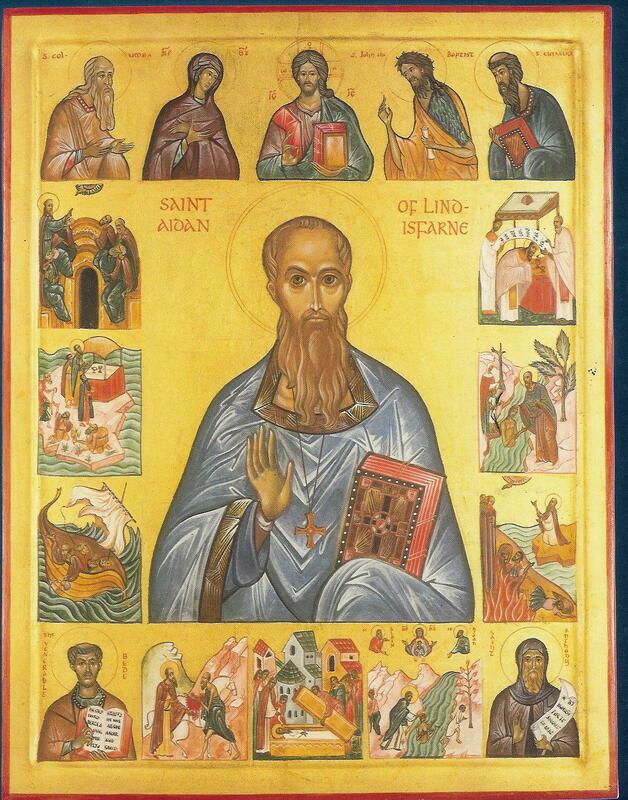 He dispatched Jaruman, the Bishop of Mercia, who was assigned to reconvert the people of Essex to Christianity. IN THE BEGINNING GOD created heaven and earth and everything in it, says the prophet Moses, inspired by the Holy Spirit in the holy Scriptures. In olden times, my fellow Christians, people were made good. Among the many there was a man named Moses. As a young child, my brethren, Moses received two things in his heart, love of God and love of his brethren. Have these two loves, [which produce] joy, glory, exultation, riches, treasures. Let us rejoice with these two loves always. Moses was originally a slave, but was driven from his master's house on account of his immorality. He joined some robbers, and became leader of the band. After having perpetrated many evil deeds and dared some murders, by some sudden conversion he embraced the monastic life, and attained the highest point of philosophy. 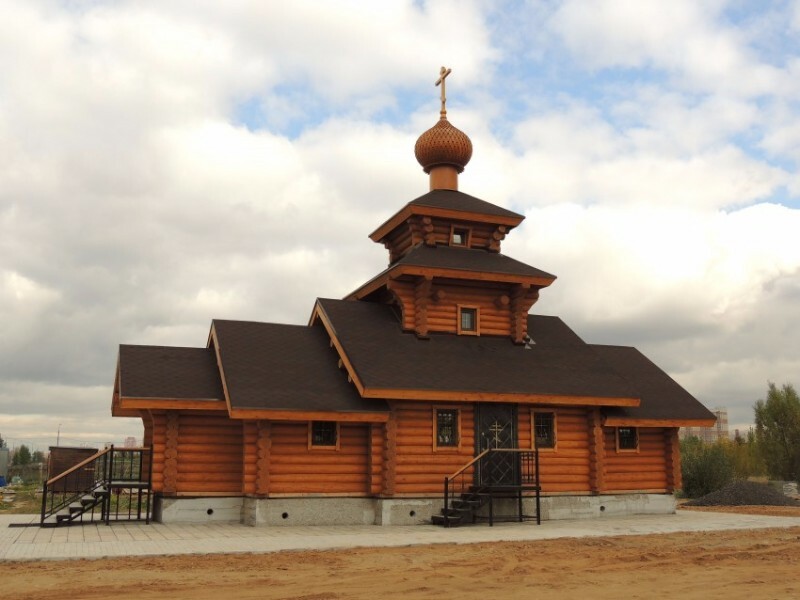 This wooden church dedicated to Saint Moses Murin the Black is one of the dozens of new churches built in Moscow. This church is specifically located in South Butovo and was consecrated in 2015. 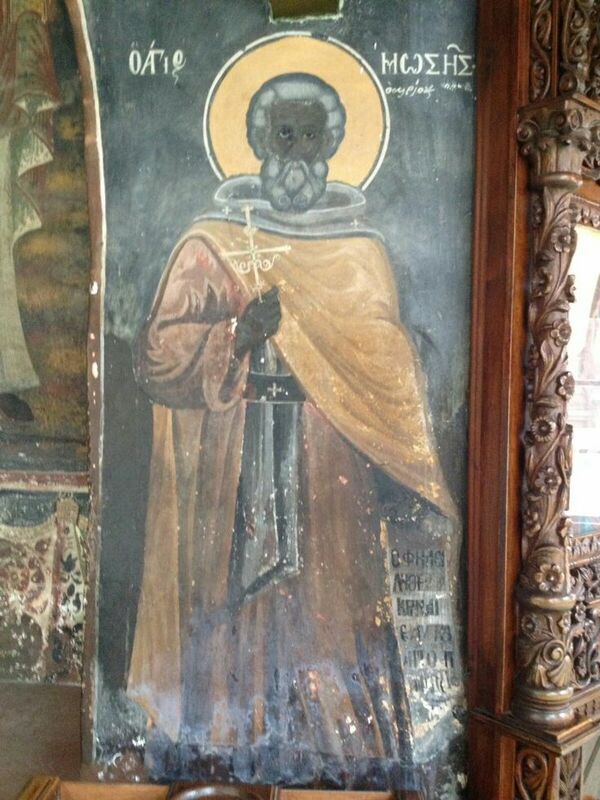 Saint Moses in Russia is called "Murin", which means "like an Ethiopian". 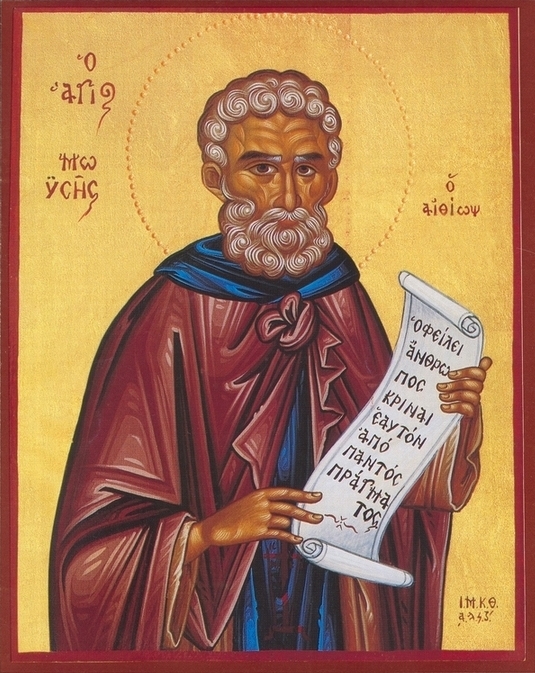 Saint Moses a patron saint of those given over to drunkenness. For on it, she saw God as a child. OUR LORD AND GOD Jesus Christ, the sweetest master, the creator of angels, my brethren, moved by the compassion and great love which he has for our race, has granted us and continues to grant us each day his immeasurable gifts. 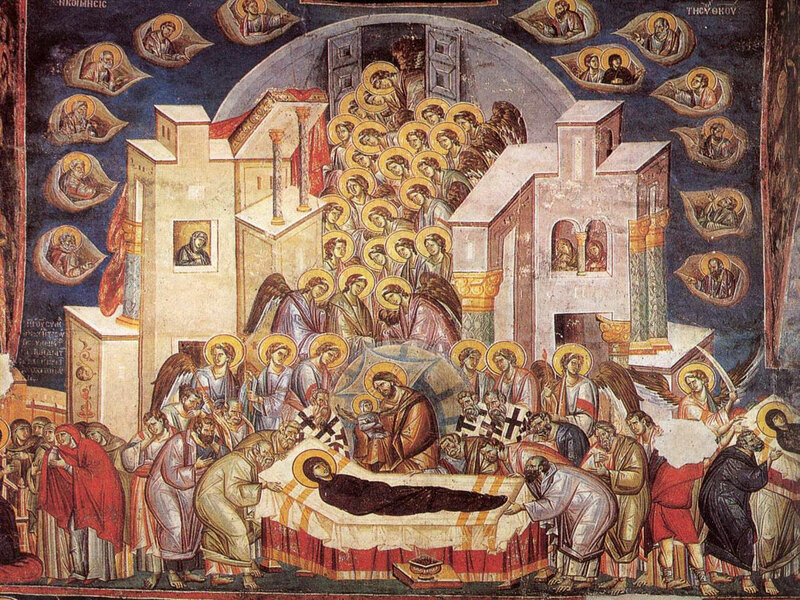 Behold how he's made us worthy this evening to glorify and honor him and our Lady the Theotokos. 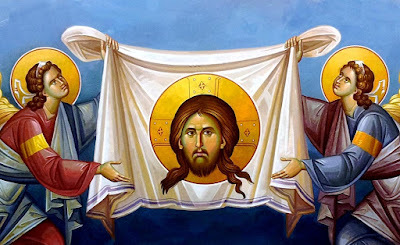 And if the Lord were to forgive us our sins through her intercessions and make us worthy of his kingdom to worship and glorify the All-Holy Trinity, we would rejoice and be glad always. For you sensibly stored your treasures in heaven. 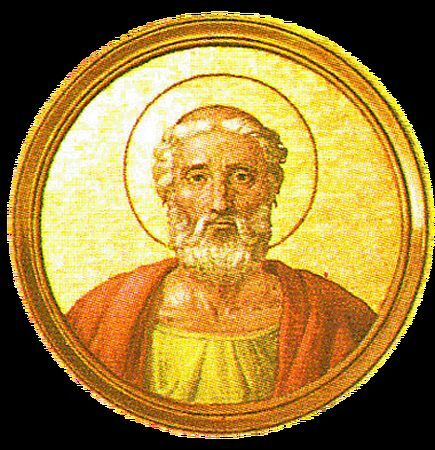 Our Holy Father Liberius, a Roman, became Pope of Rome on April 17, 352, amid the Arian crisis of the fourth century. Emperor Constantius, an Arian himself, knew he had no hope of uniting Christians by a Semi-Arian formula if Pope Liberius continued to defend orthodoxy. 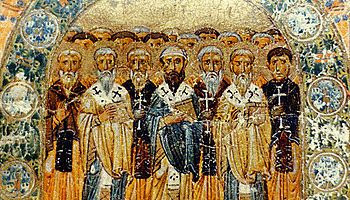 At a synod held in Milan in 353, the emperor demanded that Saint Athanasius be condemned and warned the bishops to obey him or face exile. Some bishops refused, and they were promptly banished. 16. And, behold, one came and said unto Him, "Good Teacher, what good thing shall I do, that I may have eternal life?" 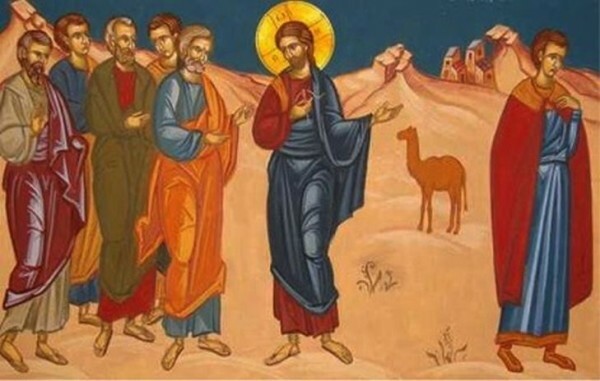 And He said unto him, "Why callest thou Me good? There is none good but One, that is, God. "Search the Scriptures, for in them is found eternal life." 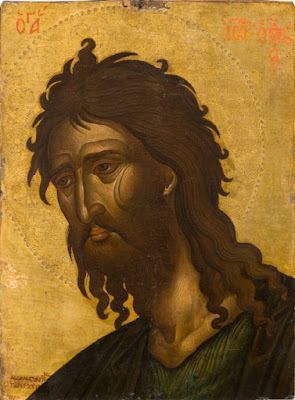 OUR LORD JESUS CHRIST, my brethren, the sweetest master and creator of angels and of all intelligible and perceptible creation moved by compassion and by his great goodness and love which he has for our race, has granted us and continues to grant us each day the dawn, and we glorify him. We read the service of Holy Unction and we have been anointed for our gain. And may the Lord have compassion on us through the intercession of our Lady, the Theotokos, and Ever-Virgin Mary, and of all the saints, to forgive our sins and to find us worthy of the kingdom of heaven, to rejoice, and glorify the Holy Trinity. 1. Church of Saints Adrian and Natalia in the village of Drepano in Argos of Nafplio. 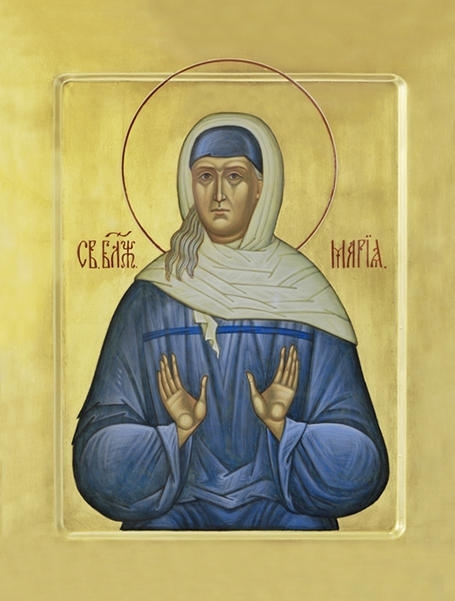 Maria Zakharovna Fedina was born in the village of Goletovka, Elatma district, Tambov Province. Later she was asked why her patronymic was Ivanovna [rather than Zakharovna]. 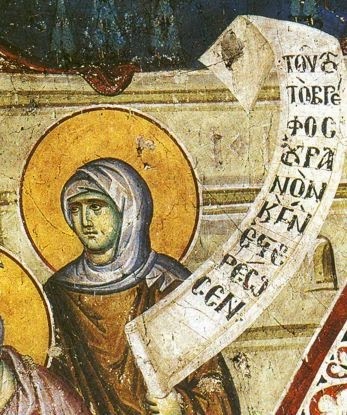 "All of us blessed ones are Ivanovnas, from St. John the Forerunner," she answered. 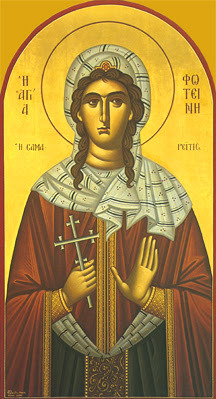 Her parents, Zachariah and Pelagia Fedina, died when she barely reached the age of thirteen. Her father died first, after her her father's death, Pelagia and Masha [Maria] moved in with the oldest son's family. But his wife made life very difficult for them, so they moved into the bathhouse. Even in her childhood Maria differed from the other children because of her unsettled character and many eccentricities. She went often to church, was quiet and kept to herself, never played with anyone, was never frivolous; she never occupied herself with her outer appearance but was always dressed in some torn, discarded dress. Cheerfully you advanced to a land without tears. THERE WAS A FARMER who went out of his house, took seed, And went to plant his fields. And as he planted, some seed fell on the road, some on stone, some among thorns, and some on good ground. The seed that fell on the road didn't grow because the ground was hard and had been trampled upon, and birds came and ate it. So the road remained barren. As well as the Church in the world. 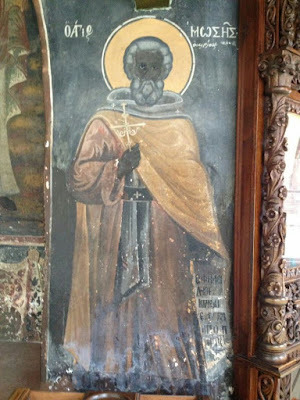 Our Holy Father Menas was from Alexandria in Egypt. 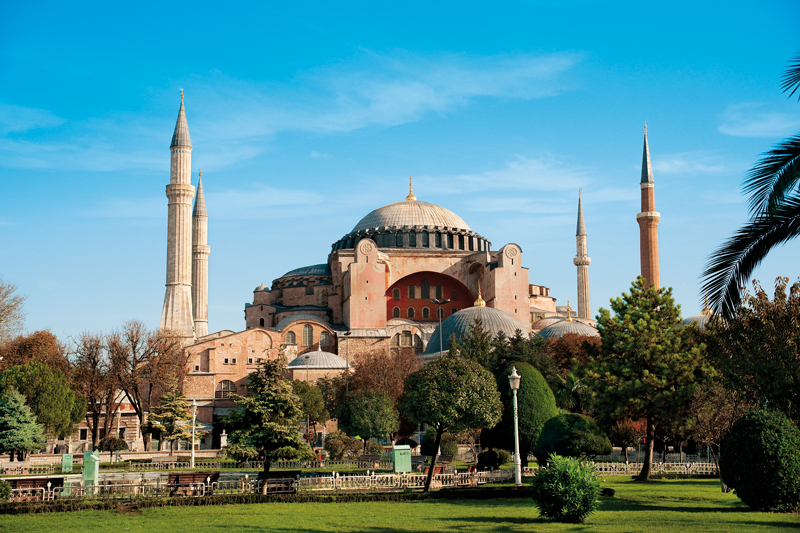 After receiving an excellent education in Constantinople, he was ordained a Presbyter and became director of the large hospital in the City that was between the churches of Hagia Sophia and Hagia Eirene. "In whatever city you enter, say peace to that city." OUR LORD AND GOD, JESUS CHRIST, my brethren, the sweetest ruler and master, the creator of angels and of all intelligible and perceptible creation, was moved by the great goodness which he has for our race and granted us and continues to grant us every day, hour, and moment an infinite number of gifts. In addition to these, he condescended and became perfect man by the Holy Spirit and from the purest blood of our Lady, the Theotokos and Ever-Virgin Mary, so that we might escape from the hands of the devil and become sons and heirs of his kingdom, to rejoice forever in paradise together with the angels, and not to burn in hell with the impious and the demons. Bearing the sign of an athlete with his cut off nose. 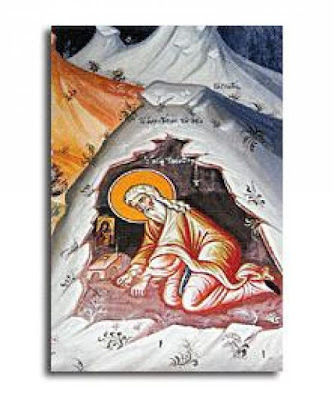 From a young age blessed George loved the monastic life, so he went to pass his life on the Olympus mountains. 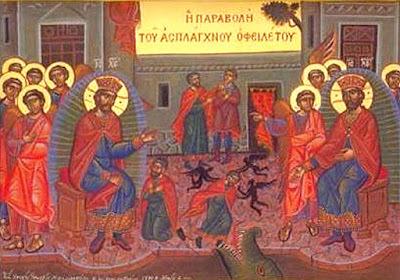 After undertaking many struggles, he boldly confessed his Orthodox faith and piety during the reign of Leo the Isaurian, who in the year 716 was destroying the holy icons and burning the relics of the Saints. 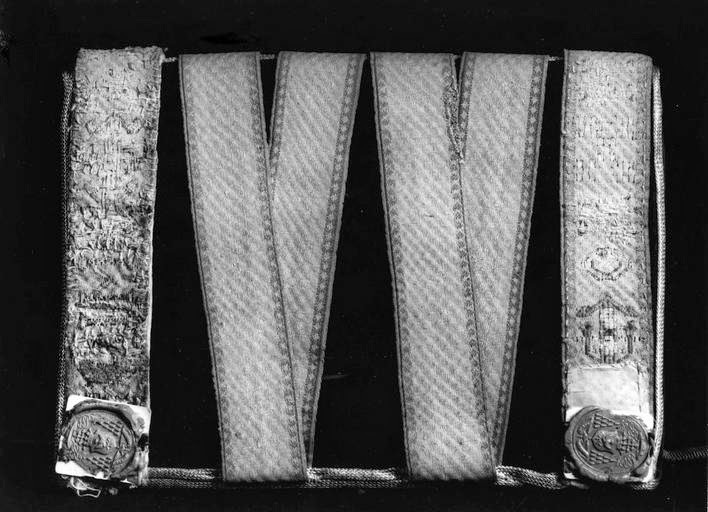 He contested and received the reward of an athlete. Saint Eutyches was a disciple of the Holy Apostle and Evangelist John the Theologian, and was full of the grace of the Holy Spirit. On an Apodosis, or Leavetaking, the Church once again gives us the opportunity to celebrate the beauty of a great feast. When we see or experience something beautiful, it is human nature to desire to have that experience again. For example, when we taste a delicious food, we desire to eat it again. The feasts of Christ and the Theotokos are a sweetness to the soul which arouses the desire to celebrate more than just once. Anthousa was received into the hands of Angels. Alive in Christ he lives with His appointed friends. Having destroyed of old their noble birth. Saint Anthousa lived during the reign of Emperor Valerian (253-260), and was from the city of Seleucia which is found in Syria. 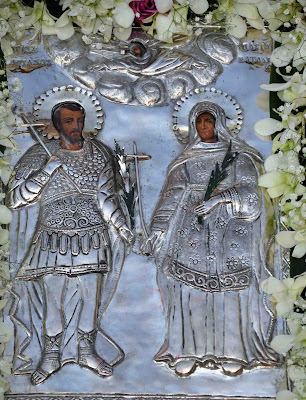 She was the daughter of Anthony and Maria, who were very wealthy, attached however to the religion of the idols. Secretly therefore she believed in Christ, wanted to receive Holy Baptism, and desired to see Bishop Athanasios, who preached the word of God in Tarsus of Cilicia. Consecration of the Church of the Apostles Peter and Paul, within the walls of the Holy Apostle and Evangelist John the Theologian, inside the revered house of the Most Holy Theotokos in Marnakiou. And the Venerable Cassian. 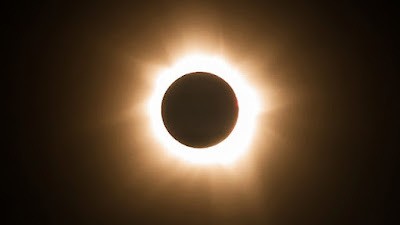 And we commemorate when the eclipse of the sun took place from the sixth to the ninth hour, so that even the stars appeared, in the year from the creation of the world six-thousand three-hundred and ninety-nine (6399, or the year 891 A.D.), at the fifteenth solar cycle, as well as lunar cycle, at the ninth Indiction, in the reign of Leo the Wise, and Alexander the brother of this pious and friend of Christ emperor. 23. "Therefore is the kingdom of the heavens likened unto a man who was a king, who wanted to settle accounts with his servants. Departed Martyr graced with His love. 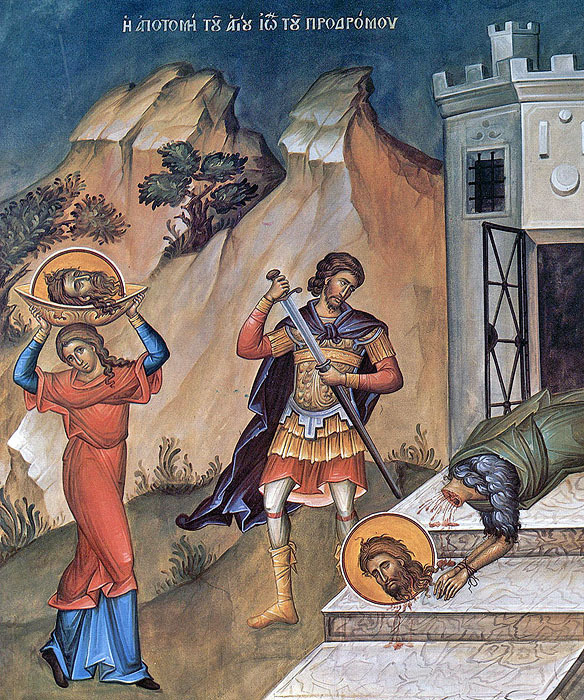 According to the Synaxarion of Constantinople, on August 20th is the "Commemoration of the Holy Martyr Photini, Outside the Doors of Blachernae." And besides the iambic verses above, no other information is given. 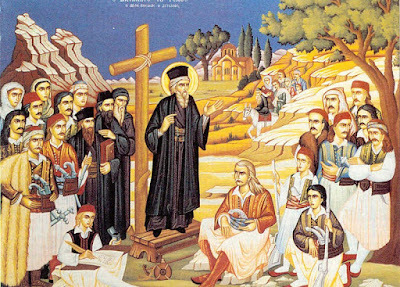 However, in an 11th or 12th century life of Saint Photini, where her post-humous miracles are recorded, there is recounted the story of how the relics of Saint Photini were discovered and worked many miracles in Constantinople, specifically outside of the Church of Blachernae, and a shrine was erected there in her honor, and on this day it celebrated its feast. Thus, by the 10th century, her veneration was centered in Constantinople where they celebrated both her martyrdom (March 20th) and the discovery of her relics (August 20th). But sees the everlasting light after his demise. 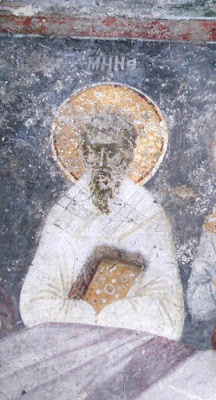 The Cave of Saint Timothy is a hollow in shale rock, 7-8 meters deep, in which Saint Timothy (Aug. 16) lived during the summer months in asceticism and reposed in peace in 1590. According to the local tradition, there is the inexplicable phenomenon of water appearing inside the cave only in the summer months. 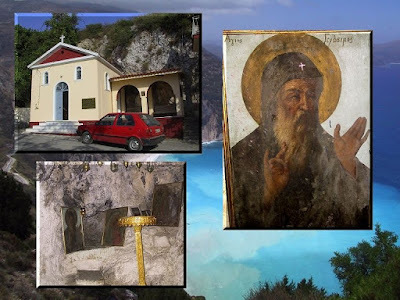 Next to the cave is a church dedicated to the Saint, the foundations of which were established on July 13, 1993, and it was consecrated on July 13, 1999. The Donskoi Icon of the Mother of God, also known as the Don Icon, was painted by Theophanes the Greek (c. 1340–c. 1410). 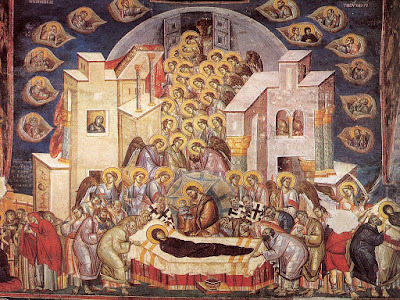 It is a two-sided icon, on the back of which is a depiction of the Dormition of the Theotokos. It is made in the traditional style of the Eleousa icons, in which Mother and Son show tender affection towards each other. 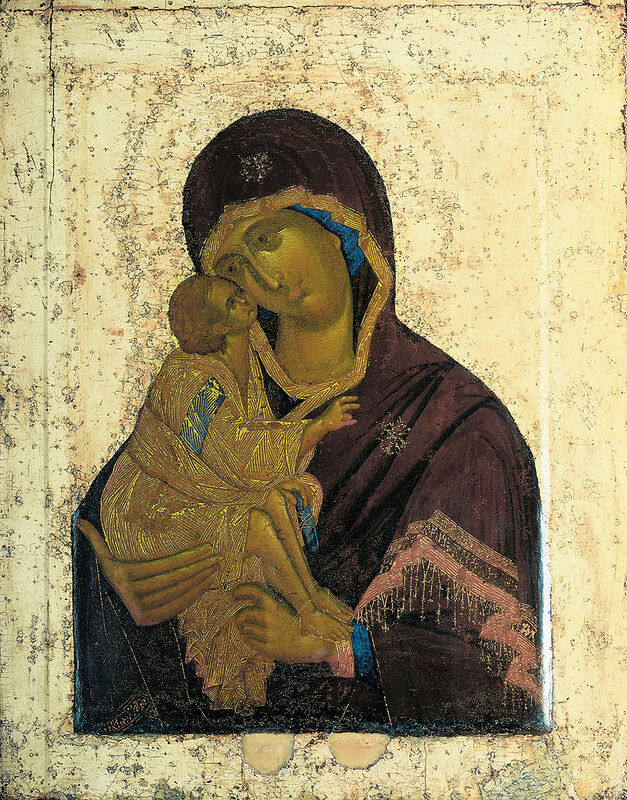 The Donskoi Icon was probably originally located in the Dormition Cathedral in Kolomna, built by Great Prince Dimitri Donskoi. The United States Commission on International Religious Freedom (USCIRF) issued its annual religious freedom report this past Tuesday, slamming allies and foes alike for their shortcomings. The Cave of Saint Gerasimos in Kefallonia is on a hill above the tourist resort of Lassi, just 3 km from Argostoli, the capital of Kefallonia. This is the cave where Saint Gerasimos, the patron saint of the island, came to after having lived in a cave for five years in Zakynthos, living here for five years as well, leading a strict ascetic life. 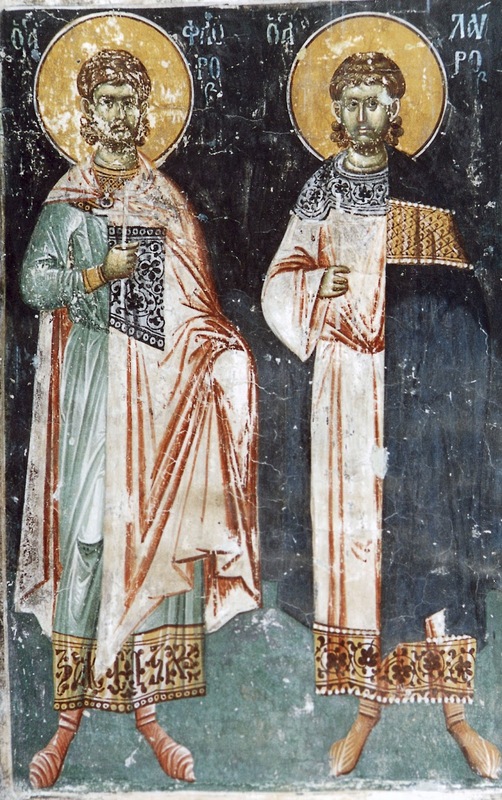 Floros and Lavros were given to the well. Given to all together, they left it behind in the fire. These Saints were twin brothers according to the flesh, stone-cutters by trade, which they learned from Saint Patroklos and Saint Maximos, who were martyred for Christ. 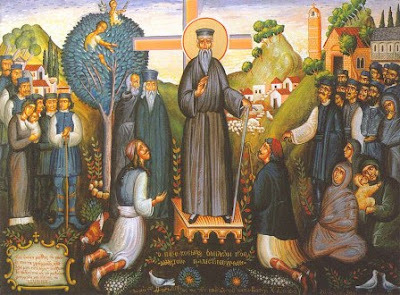 Because their teachers were martyred, they left their way of life in Byzantium, and went to Illyricum, namely Slavonia, to the province of Dardania, in the city called Ulpiana. There they sought to find stones in the mines for the ruler Loukianas, where they worked their trade. After they were sent to Likinios, who was the son of the queen Elpidia. Likinios gave the Saints money, and ordered them to build a temple to the idols, the plans of which he drew up on paper as to how he wanted it to look. The Saints took the money and distributed it among the poor, and at night they turned to God in prayer. That now with the Saints you rejoice O Saint. By his holy intercessions, O God, have mercy on us. Amen. "Men who are abominable, and they killed me in fire." Was condemned to the fire, not becoming fainthearted. Like a horse is bound, in words. Flee the outer fire, Scripture says. Juliana, were beheaded as siblings. To Kodratos, Akakios and Stratonikos. Wise blood, was shed for you by the sword O Christ. Were also seen to be siblings by the sword. Our Holy Father Timothy was born in 1510 at Kalamos of Attica, and according to tradition his father was an educated priest who passed on this education to his son. 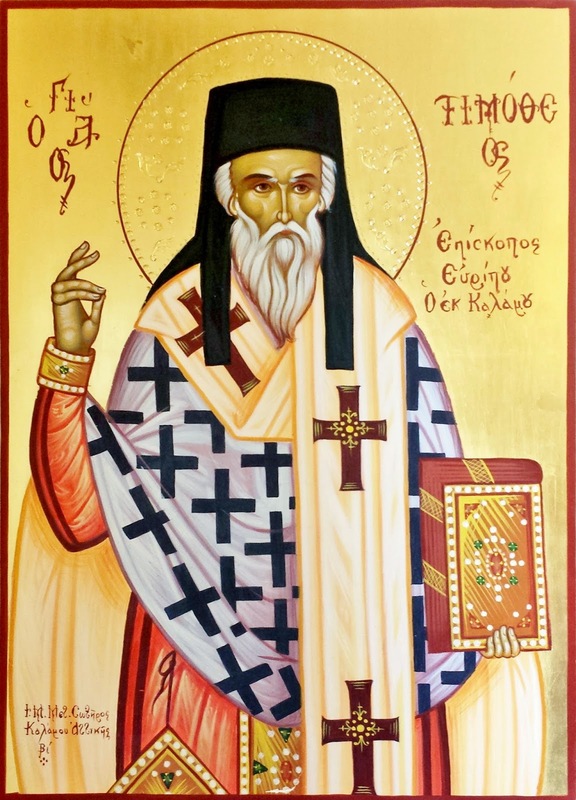 At a young age he had a spiritual relationship with the Bishop of Orion in Evia, who saw his deep faith and rare spiritual gifts, and thus sponsored him to study in Athens. Having completed his studies, Timothy returned to his spiritual father in Orion, who tonsured him a monk, then ordained him a deacon and a presbyter. In 1553 the Bishop of Orion reposed and Timothy was elected to replace him. 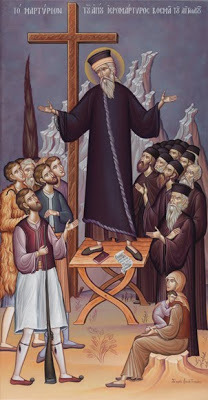 Then in 1555 he was elevated to become Metropolitan of Euripos, which was centered in Chalkida. 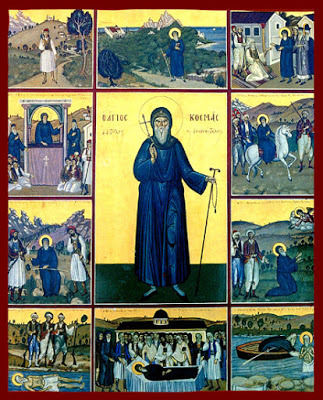 St. Gerasimos the New Ascetic was born in Trikala of Corinth to the renowned aristrocratic Notaras family. Before St. Gerasimos went on to live an ascetic life on the island of Kefallonia, he lived in his forties for five years as an ascetic in a secluded cave on the island of Zakynthos. There he ate only greens with neither bread or salt, and legumes soaked in water. His main form of sustenance however was prayer, vigils, the constant remembrance of God, and the study of Holy Scripture.